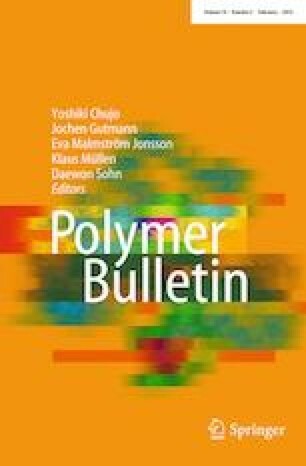 An A2B2-type miktoarm star copolymer with two linear poly(ε-caprolactone) (PCL) and two linear poly(cyclohexene oxide) (PCHO) arms was synthesized by using ring-opening polymerization (ROP), click chemistry, and photoinduced cationic polymerization, respectively. The ROP of ε-CL with a dihydroxy functional initiator, 3-cyclohexene-1,1-dimethanol, produced a well-defined two-arm PCL with a cyclohexene end-functional group, (PCL)2-CH. The subsequent bromination of (PCL)2-CH followed by azidation gave a diazido end-functionalized PCL, (PCL)2-(N3)2. Then, a well-defined two-arm PCL macrophotoinitiator with benzoin end-functional groups, (PCL)2-(PI)2, was prepared by the azide/alkyne click reaction of this (PCL)2-(N3)2 and PI-alkyne, a separately prepared benzoin photoinitiator bearing a terminal alkyne group. Solid data obtained from the 1H NMR, FT-IR, GPC, UV, and fluorescence spectroscopic studies proved the successful formation of the macrophotoinitiator having a core connected to two PCL chains and two benzoin photofunctional groups (PI). Finally, a novel A2B2-type miktoarm star copolymer was synthesized via photoinduced free radical-promoted cationic polymerization of cyclohexene oxide (CHO) monomer using (PCL)2-(PI)2 as photoinitiator. The obtained star copolymer consists of two PCL arms as A blocks and two PCHO arms as B blocks, (PCL)2-(PCHO)2, and was characterized by 1H NMR, FT-IR, and GPC measurements. The thermal behaviors of all the intermediate and final polymers were studied by thermogravimetric and differential thermal analysis (TG/DTA). The authors would like to thank Harran University, Scientific Research Council (HÜBAK) and Dicle University, Scientific Research Projects Coordinator (Project No: 13-MYO-125) for financial support.